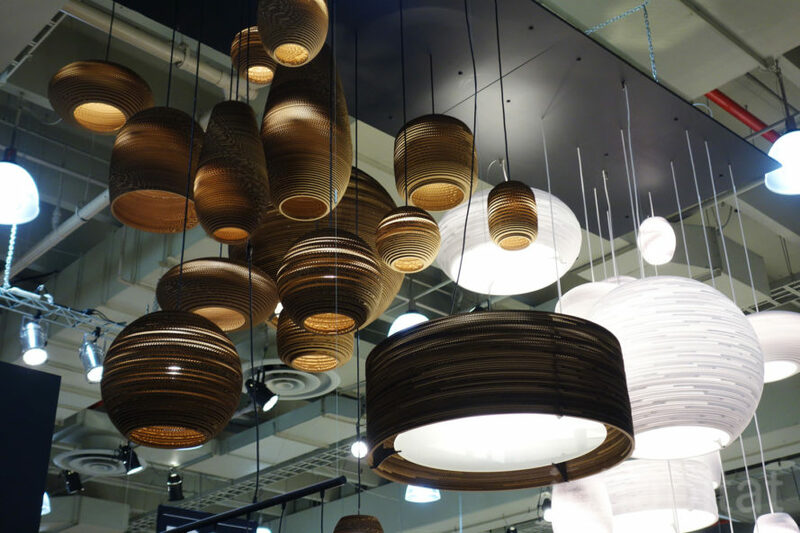 With more and more designers realizing the demand for sustainable lighting, the vast array of energy-efficient lamps and fixtures on the market now is truly impressive. 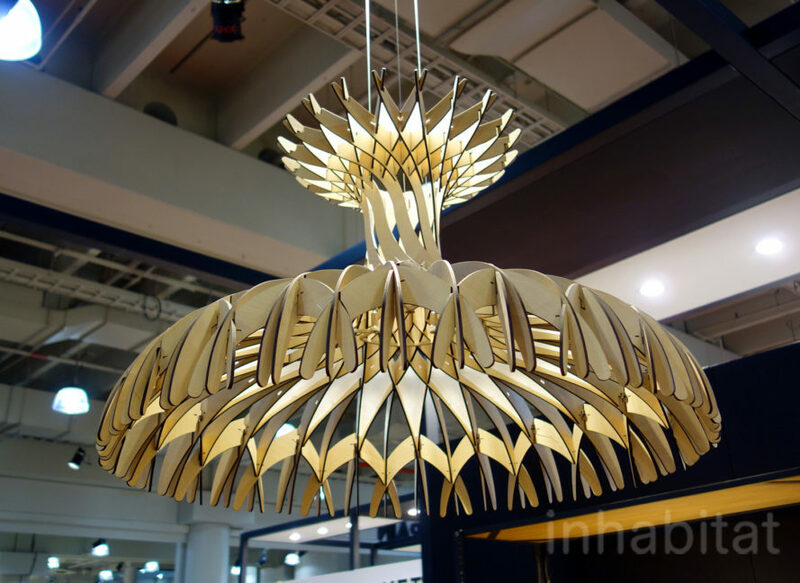 In addition to using energy-saving LED lights, we found that many designers are also combining recycled and recyclable materials to make durable pieces that will stand the test of time. 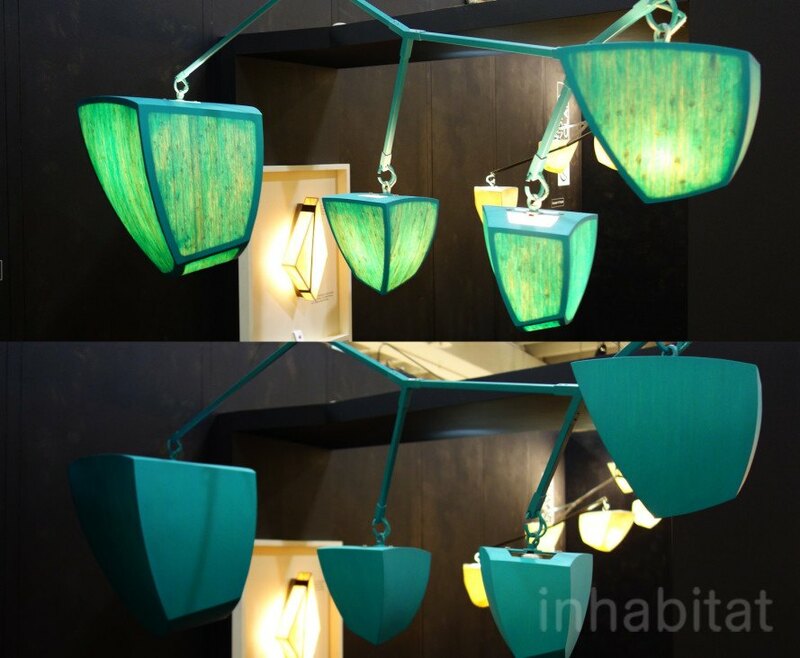 Whether eco-friendly, or built to last from generation to generation, green lighting is having an exciting moment - read on to check out 13 of our favorite illuminating pieces spotted during NY Design Week for your viewing pleasure. 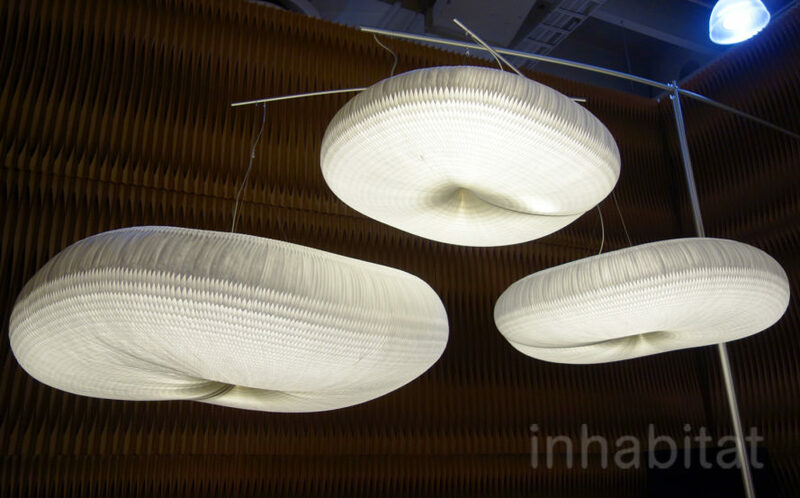 Molo Design’s billowy cloud lamps undulate like a soft canopy. 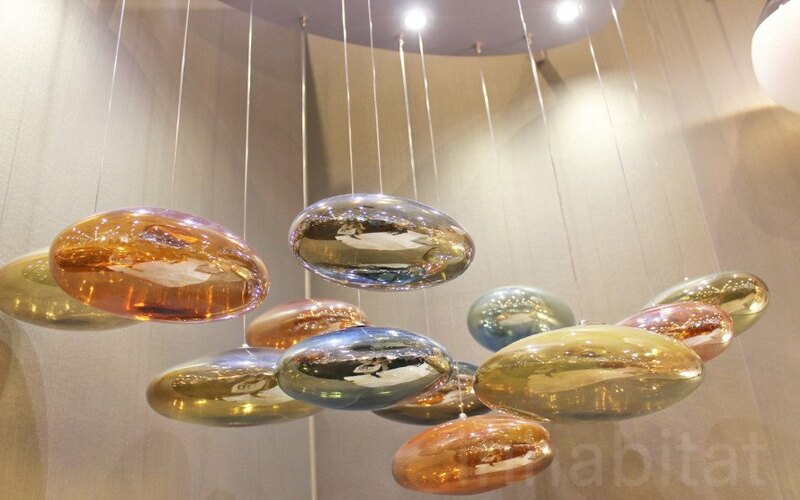 The clusters of the hanging lamps form indoor cloudscapes inside your office or living room. Made from recyclable Tyvek, the accordion-fold cloud shapes are gathered around long-lasting LED lights, creating a softly illuminated sky in your favorite room. 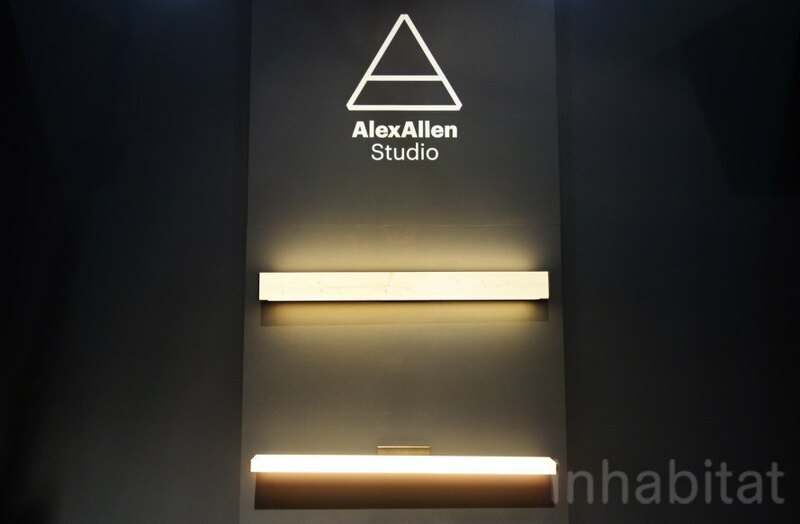 The typical 2×4 piece of lumber is given a modernized twist with AlexAllen’s beautifully simplistic pendant and wall-mounted lamps. A strip of recessed LED lights illuminates the 2×4’s lower edge, creating a surprisingly warm glow emanating from what appears to be an ordinary piece of wood. Pelle’s modular lighting system can be configured- or reconfigured- to suit any sized room or work environment. The length of the sleek, linear arms is adjustable, and can be added together with jewel-shaped connectors to make for larger geometries. Made from durable porcelain that is meant to last the test of time, Modern Verve’s Machine Flower is controlled by a remote control keypad, opening and closing at the touch of a finger. The motorized petals bloom and close to reveal and control warm LED light inside. 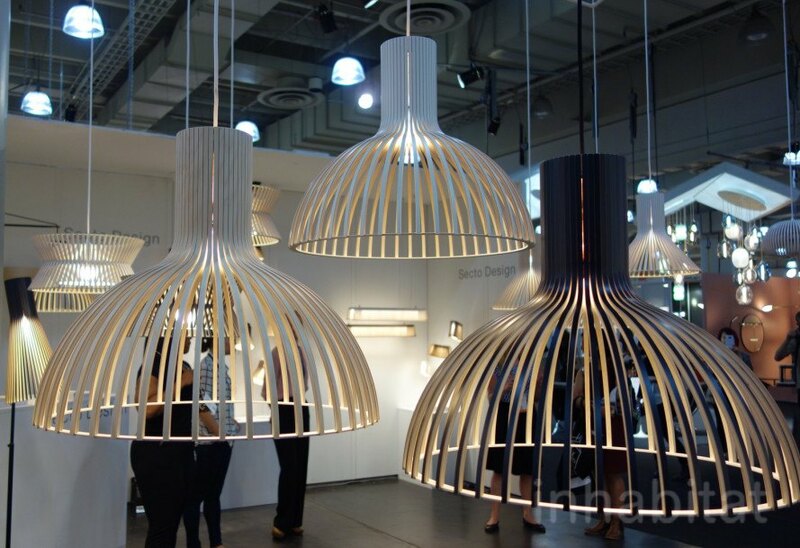 Finnish design company Secto transforms PEFC-certified formpressed birch into delicate pendant shades, which give a soft luminosity. Four finishes accentuate the form, which channels vintage vibes with its hoop-skirt shape. The Ivy Series of dual-purpose pendant lamps totally transform between night and day- appearing like Calder-esque mobiles when switched off, and illuminating in translucence when switched on. Made from sustainable wood that can be painted in a myriad of custom finishes, Claire’s designs are perfect for the art collector that pushes the boundaries of design. Inspired by the beauty of the hexagonal structures pulled from chemistry, Configurate is a modular system of LED pendants that lets design lovers create their own compositions of light with dimmable, energy efficient bulbs. Brooklyn-based IN.SEK approaches sustainability by using durable materials that can withstand the wear and tear of life- and keep their quality. 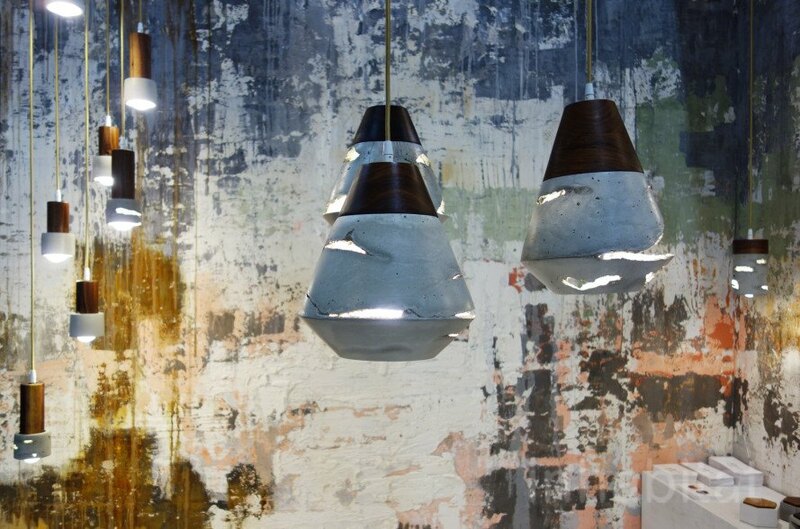 Hand-cast concrete and reclaimed wood elements give their pieces a timeless, urban look. Luke Lamp Co’s Tracer Pendant is a totally transformable LED light that can be reconfigured into thousands of shapes easily. 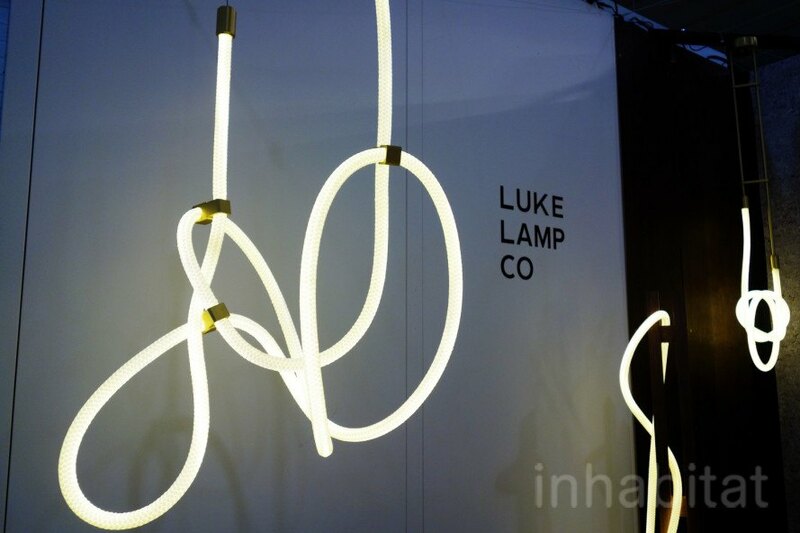 Made from 12 feet of double braided nylon rope that encases a 2-foot LED module with a 30,000 hour lifespan, the rope-like lamp is fitted with magnetic brass fixtures that can be joined together to make loops, swirls, tight coils, or even be simply splayed into a straight line. Resembling a subway map, the LA2 Connected system of light fixtures can snake through corridors, turn corners, or add life to an open space. 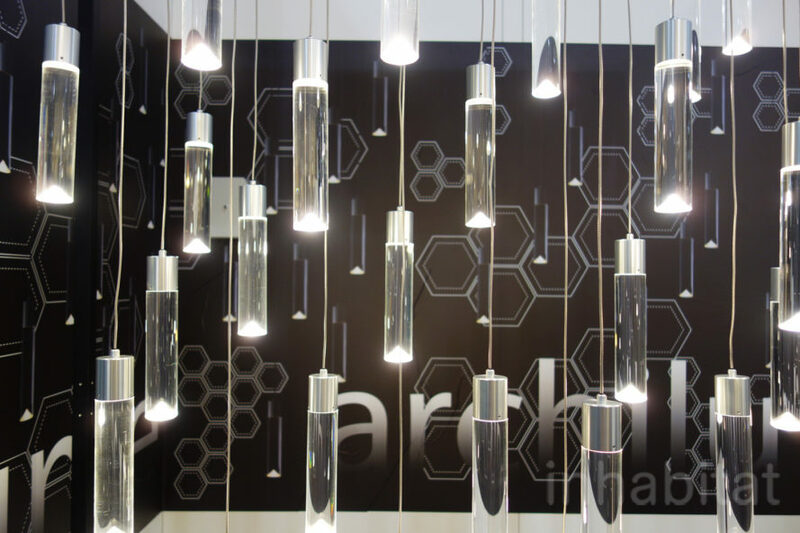 The modular system minimizes waste and uses cutting-edge LED technology. LightArt is the first lighting manufacturer to earn the LBC-Compliant Declaire Label, making them perfect for LEED-seeking projects. Available in white and natural brown, Scraplights are made from totally recyclable FSC-certified paper, produced from forests that replant more trees than they harvest. The intricate Dome 90 is a fusion of art and design: a lace-like sustainable wooden pendant that casts a beautiful pattern on the floor of any interior. More than 170 fragments of sustainable wood are hand sewn together around an LED bulb, creating a delicate interplay of light and shadow. Tracy Glover makes her expressive, emotive glass lighting fixtures by hand in her Pawtucket, Rhode Island studio. We found ourselves particularly captivated by her ethereal Koi Pond pendant light, which depicts a school of pearlescent Koi fish swimming together underneath four LED lights that allow the Clear Lustre, Aurora Lustre, Smokey Quartz and Steel Blue Lustre glass to dance and sparkle. Check out more of our green lighting faves on our Flickr stream. Molo Design’s billowy cloud lamps undulate like a soft canopy, The clusters of the hanging lamps form indoor cloudscapes inside your office or living room. 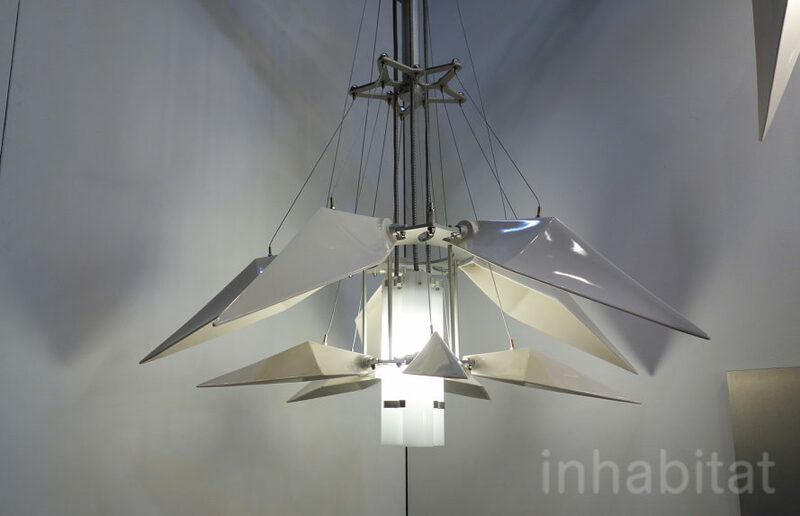 Made from recyclable Tyvek, the accordion-fold cloud shapes are gathered around long-lasting LED lights, creating a softly illuminated sky in your favorite room. The typical 2x4 piece of lumber is given a modernized twist, with AlexAlen’s beautifully simplistic pendant and wall mounted lamps. A strip of recessed LED lights illuminates along the 2x4’s lower edge, creating a surprising warm glow, emanating from an ordinary piece of wood. 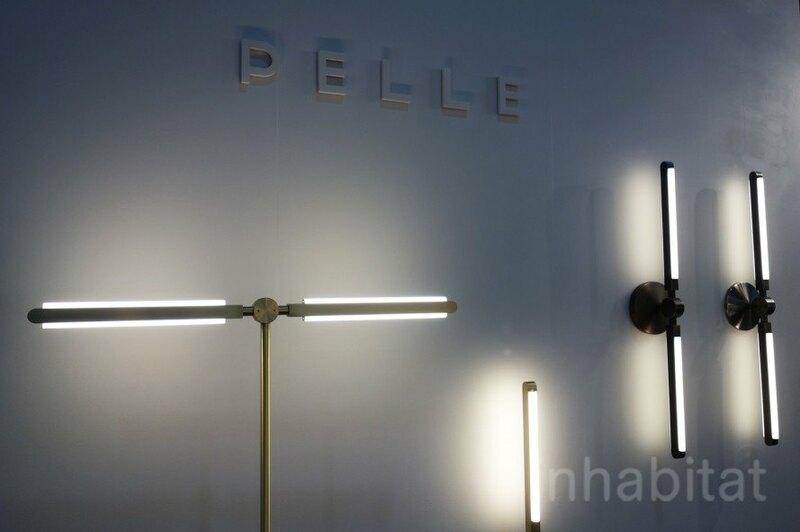 Pelle’s modular lighting system can be configured- or reconfigured- to suit any sized room or work environment. The length of the sleek, linear arms are adjustable, and can be added together with jewel-shaped connectors to make for larger geometries. Inspired by the beauty of the hexagonal structures pulled from chemistry, Configurate is a modular system of LED pendants that lets design lovers create their own compositions of light with dimmable, energy efficiency. Luke Lamp Co’s Tracer Pendant is a totally transformable LED light that can be reconfigured into thousands of shapes easily. Made from 12 feet of double braided nylon rope that encases a 2 foot LED module with a 30,000 hour lifespan, the rope-like lamp is fitted with magnetic brass fixtures that can be joined together to make loops, swirls, tight coils, or even be simply splayed into a straight line. 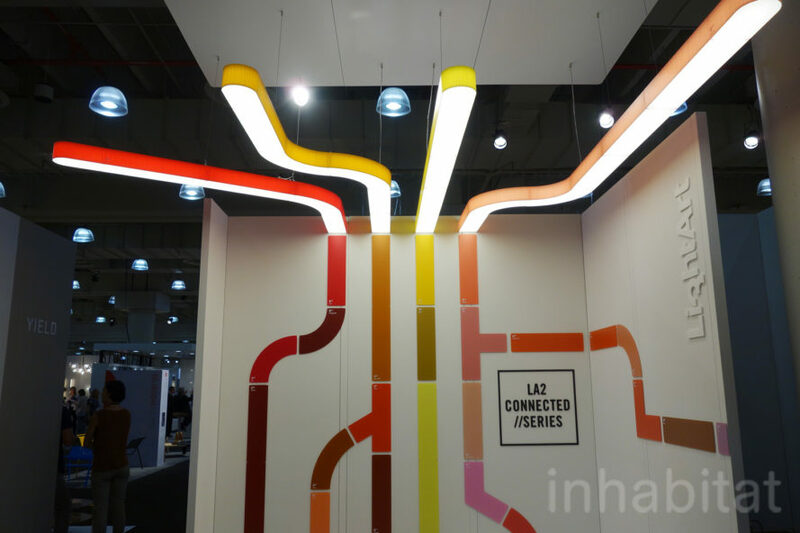 Resembling a subway map, the LA2 Connected system of light fixtures can snake through corridors, turn corners, or add life to an open space. The modular system minimizes waste and uses cutting-edge LED technology. LightArt is the first lighting manufacturer to earn the LBC-Compliant Declaire Label, making them perfect for LEED seeking projects. The intricate Dome 90 is a fusion of art and design, in a lace-like sustainable wooden pendant that casts a beautiful pattern on the floor in any interior. More than 170 fragments of sustainable wood are hand sewn together around an LED bulb, creating a delicate interplay of light and shadow.